We have been trying to make cars cleaner and more efficient, but has this really made them more sustainable? 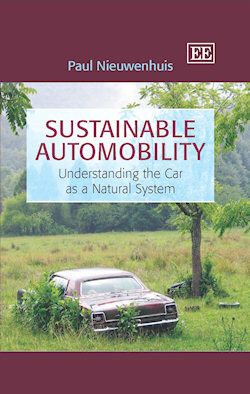 This book argues, within the context of sustainable consumption and production, that we should see the car as a natural system, subject to natural laws and processes. As part of this new perspective we need to change our attitude to cars, building more durable relationships and co-evolving with them. Revolutionary, perhaps; but if we get it right, this approach will allow us to enjoy motoring – albeit in modified form – into the future. The book draws on a range of disciplines, including industrial ecology, engineering, philosophy, anthropology, consumer psychology and object-oriented ontology, as well as providing industry examples to support its innovative case. This ground-breaking book will be of interest to academics of sustainability, sociotechnical transition, management of change, engineering, biomimicry and business. It will also be of interest to automotive consultancies and those working in the car and oil industries. Paul Nieuwenhuis' innovative suggestions will certainly be of interest to government workers in industry, business and the environment, as well as various environmental NGOs. 'A very powerful, well-researched and thoughtful argument in support of the ecological versus the economic way of thinking and acting.